Equal leg aluminum channel available in a satin anodized finish in 24 ft., 12 ft., 8 ft., 6 ft. and 4 ft. lengths. See above Docs link to display all Channels in a Table View. 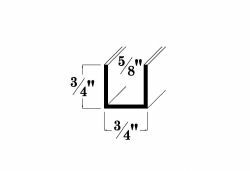 Select a Length 24 ft. 12 ft. 8 ft. 6 ft. 4 ft. Copyright © Brunner EnterprisesTM Inc. All rights reserved.